We spoke with the man who posted this for-the-birds snap. If getting up close and personal to scavenging birds of prey is the type of thing that makes you uneasy, then be glad you weren&apos;t on this Middle Eastern flight. Reddit user "lensoo" posted this photo yesterday of an airplane cabin brimming with a ridiculous amount of birds, and it&apos;s since gone crazy viral. The Reddit post was titled "My captain friend sent me this photo. Saudi prince bought ticket for his 80 hawks," though Business Insider notes that the birds are likely falcons, not hawks. The falcon is the national bird of the United Arab Emirates, and falconry is a popular pursuit of the wealthy. Falconry in the desert of Dubai. Lensoo did confirm that the picture came from his friend, and that he&apos;s been overwhelmed with the amount of inquiries various media outlets have been making about the bizarre photo. "My friend sent the pic," lensoo told Maxim. "It was overwhelming day with question." To the western world, a photo such as this seems strange. And it may come as a surprise that Etihad Airways, and airline that operates out of the United Arab Emirates, actually has designated policies regarding falcon-related travel, as Gizmodo points out. 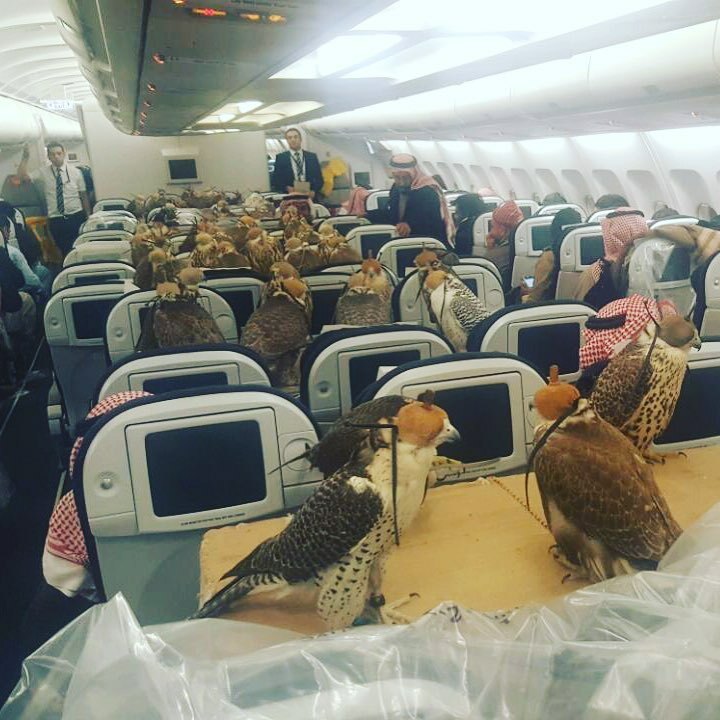 From the Etihad Airways website: "We accept the carriage of falcons in the main aircraft cabin provided that all the necessary documents have been obtained. We also accept falcons as checked baggage." They aren&apos;t kidding about the "necessary documents" part, either. Any passenger travelling with a falcon must make sure the bird goes through the same security checks and they that they have a government-issued passport for their falcons. What you do with this information is your choice, but now you know.